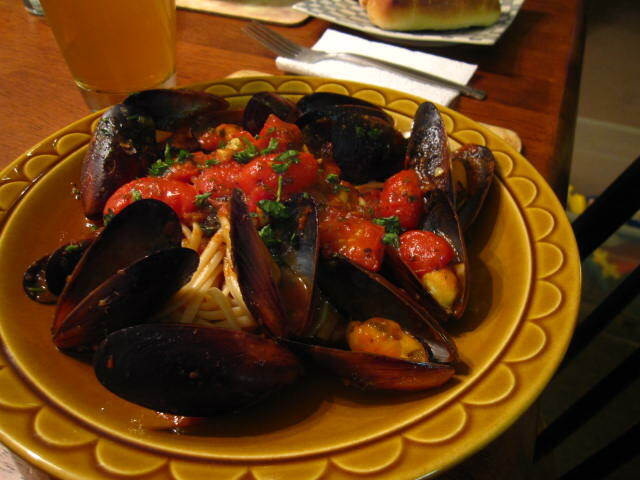 Mussels marinara with cherry tomatoes over linguine. Heat butter in a pan. Add minced garlic, dried oregano, dried basil, crushed red pepper flakes, salt and pepper. Add mussels and deglaze the pan with a splash of white wine. Add marinara, a tiny bit of Sriracha and halved cherry tomatoes. Reduce heat, cover and simmer until all the mussels have opened up. Serve over pasta with a wedge of bread.